At Bosk, we believe that the best way to improve ourselves and ensure the success of our business is to constantly get out of our comfort zone and to be challenged. This is what we will do on a daily basis as part of the 9th ECOFUEL cohort. ​We are very proud to be one of the 5 companies selected in this renowned program in Quebec. Pulp and Paper Canada interviewed Bosk and the National Research Council about our project. 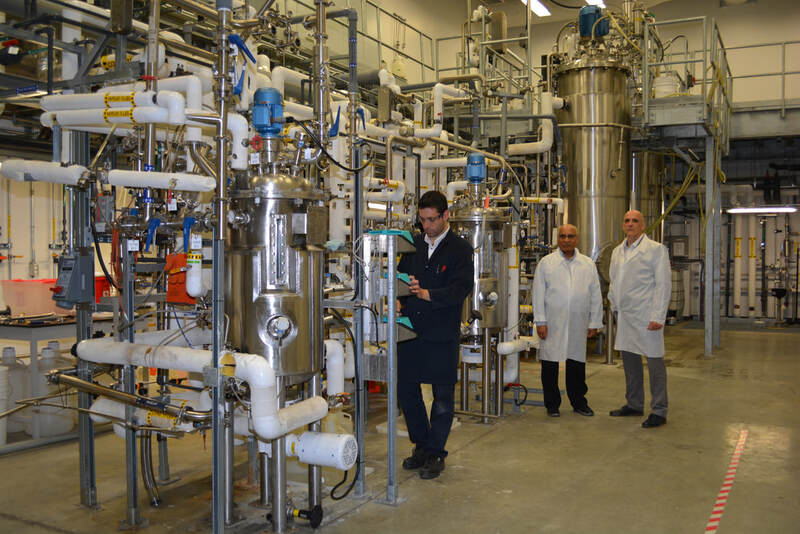 Bosk Bioproducts is featured in the NRC's (National Research Council Canada) innovation success stories. With over ten years of experience in the characterization and transformation of bioplastics, the NRC is reknown for its expertise in the development of bioplastics. That is why Bosk chose to work with the NRC to develop blends and alloys. ​Indeed, the collaboration of the NRC and Bosk started when Bosk decided to commercialize finished products and that we wanted to make sure our compostable plastic could be used by conventional equipment and processes used in plastic industry. Bioplastics MAGAZINE has published an article about Bosk's compostable compounds in its October 2017 issue. Bioplastics MAGAZINE is the only independent trade magazine worldwide dedicated to bioplastics (i.e. plastics made from renewable resources and/or biodegradable/ compostable plastics). The print magazine is being published 6 times a year. Quebec, July 2017 – Professor Rajeshwar Dayal Tyagi , Director of Bosk’s scientific advisory board and professor at INRS, received the Outstanding Scientist Award from the International Bioprocessing Association. This prestigious award is in recognition of his outstanding contribution in environmental biotechnology. He was presented the reknowned award at the International Forum on Industrial Bioprocesses, which took place in China in May 2017. In recent years, Professor Tyagi has earned a number of awards and distinctions in recognition of the quality of his work aimed at reducing waste and turning it into value-added products. Accolades include the Superior Achievement Award from the American Academy of Environmental Engineers and Scientists, the ASCE State-of-the-Art of Civil Engineering Award, the Global Honour Award for Applied Research from the International Water Association, and the 2016 Mahatma Gandhi Pravasi Samman Award. He is also a Fellow of the International Water Association and a member of the European Academy of Sciences and Arts. Bosk is proud to count professor Rajeshwar Dayal Tyagi among its scientific team and congratulates him on this international recognition. Montreal, July 27, 2017 - At WCIB, Bosk Bioproducts, a young private company in Quebec, presented a new generation of clean plastic: truly compostable, nontoxic, GMO-free and made from renewable untapped by-product of the pulp and paper industry. From July 23 to 26, 2017, at the Palais des congrès de Montréal, Bosk Bioproducts attended the WCIB, a large-scale congress which brings together more than 1,200 key bio-economy stakeholders from throughout the world. Thanks to the CRIBIQ and the Ministry of the Economy, Science and Innovation (MESI) for making this participation possible. Bosk Bioproducts is proud to have been one of the twenty participants of the "Espace Québec" delegation. This technological showcase, bringing together key-players in the Quebec innovation ecosystem, has fostered high-quality exchanges and proved to be an excellent business opportunity. Moreover, Paul Boudreault, CEO of Bosk Bioproducts, had the privilege to participate as a speaker to the GreenTech Investor Sessions. It was the perfect opportunity for Bosk's official fund raising launch. Bosk took advantage of his presence to present a new generation of clean plastic. This biopolymer that can substituted conventional plastic is made from renewable untapped by-product of the pulp and paper industry, is nontoxic, GMO-free and is fully compostable. At the end of life, this bioplastic can be thrown into the composting that is done at home, with the residues of gardening and cooking. Finally, WCIB enabled Bosk to recruit strategic partners for the implementation of its marketing plan. Bosk does not sell plastic, but rather compostable plastic finished products. WCIB facilitated meetings with qualified partners who will participate in the creation of products that meet the real needs of end consumers. The aim of Bosk Bioproducts is to create products that contribute to the daily well-being of consumers and the well-being of future generations. At Bosk, we make news because of our innovative approach to solving global plastic waste problem. Learn more through the press releases and news articles found here. Bosk is dedicated to wipe away the global plastic waste problem by providing product demanded by today’s eco-conscious consumers. ​Through partnerships with the best in their field, we develop, manufacture and commercialize clean bioplastic products that are completely compostable, non-GMO, non-toxic and made from industrial carbon sources, at a competitive cost. Be part of this refreshing value chain and take advantage of a new clean market space. Bosk se dédie à l’élimination du problème mondial des déchets de plastique en offrant des produits réclamés par les consommateurs éco-conscients. Grâce à des partenariats avec les meilleurs dans leur domaine, nous développons, fabriquons et commercialisons des produits en bioplastique écologique : entièrement compostable, sans OGM, non toxiques, fait à partir de matières renouvelables issues des opérations de l’industrie papetière, et ce, à un coût compétitif.